Our mission is to create and maintain a community where people can come have FUN and "RECLAIM" their health and fitness by performing constantly varied, functional movement, at a high intensity; which is CrossFit. CrossFit is a core strength and conditioning program. We have designed our program to elicit as broad an adaptational response as possible. CrossFit is not a specialized fitness program but a deliberate attempt to optimize physical competence in each of 10 fitness domains. They are cardiovascular/respiratory endurance, stamina, strength, flexibility, power, speed, coordination, agility, balance and accuracy. CrossFit was developed to enhance an individual's competency at all physical tasks. Our athletes are trained to perform successfully at multiple, diverse and randomized physical challenges. This fitness is demanded of military and police personnel, firefighters and many sports requiring total or complete physical prowess. CrossFit has proven effective in these arenas. 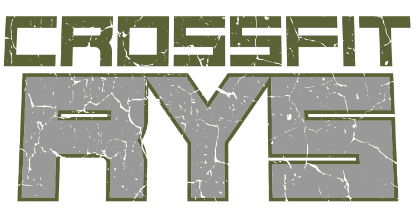 At CrossFit RYS, we incorporate strongman movements such as, flipping tractor tires, lifting atlas stones, performing farmer carries, carrying yokes, clean and pressing logs, lifting and carrying kegs and sandbags, as part of our functional movements. Performing these functional movements closely mimics what we do in real life; barbells only exist in the gym. This also adds variety, which contributes to the "constantly varied" component to what we do. This doesn't mean that we will not use dumbells, barbells and/or kettlebells; because we definitely will! Lastly, by adding INTENSITY to both constantly varied, functional movement, you will initiate the desired adaptation that will deliver results toward your health and fitness. MOVING HEAVY LOADS, LONG DISTANCES, QUICKLY!! 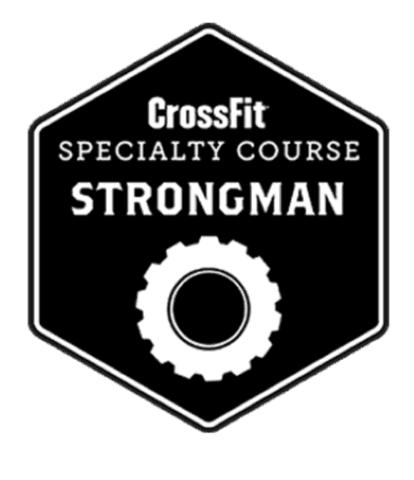 Strongman is a perfect and FUN way to increase strength without using a barbell. Because of the often awkward size, shape and consistency of the objects in strongman, the lifts tend to have less efficiency than those done with a barbell. These loads challenges the neuromuscular system in a way a barbell cannot and better mimic challenges found outside the gym. Participants in Strongman learn to lift atlas stones, carry a yoke and farmers handles, flip tires, clean and press odd objects such as a log, keg, anvil or stone at their relative level of strength. The typical strongman competition consists of five events in one day and each event is less than 60 seconds.